Two days of cooking class have come and gone, with only one trip to the camp nurse for a bandaid. After spending the majority of last week designing curriculum, it has been ridiculously fun to actually hang out with the kids, and watch them take on the cooking class. We have two groups of students, both of whom really seem to enjoy the class. Yesterday we learned about what a cast iron skillet is, and talked about dairy and whole grains. 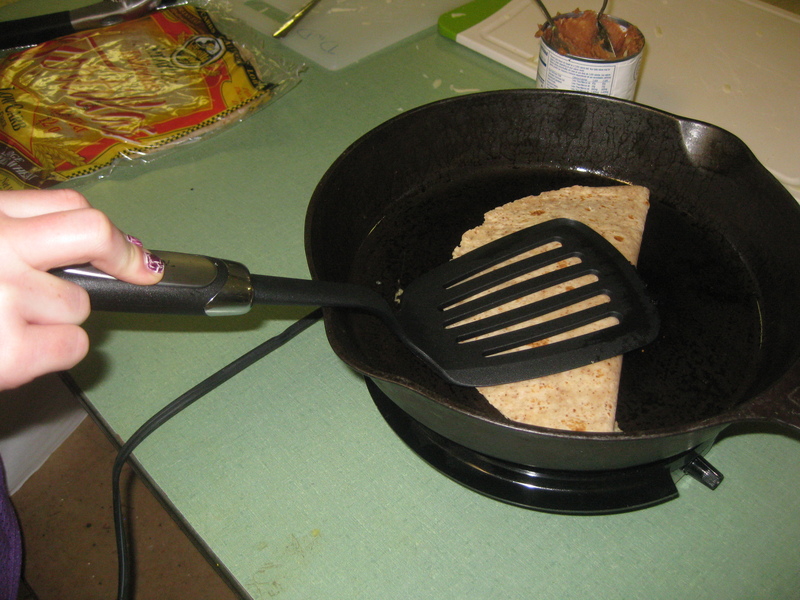 After a brief lesson on cooking safety, we made simple quesadillas by grating cheese and using whole grain tortillas. We topped them with salsa, and talked about how we could add other things to the inside to make them even more delicious. Today we started off by learning some basic measuring skills, knife skills, and a lesson on proteins. To be honest, I didn’t know what a frittata was before preparing for this class, but it’s basically an omelet that you don’t flip. The kids paired off to cut broccoli, chunk chicken, mince onion, grate cheese, “punch” and then cut peppers, and crack eggs. 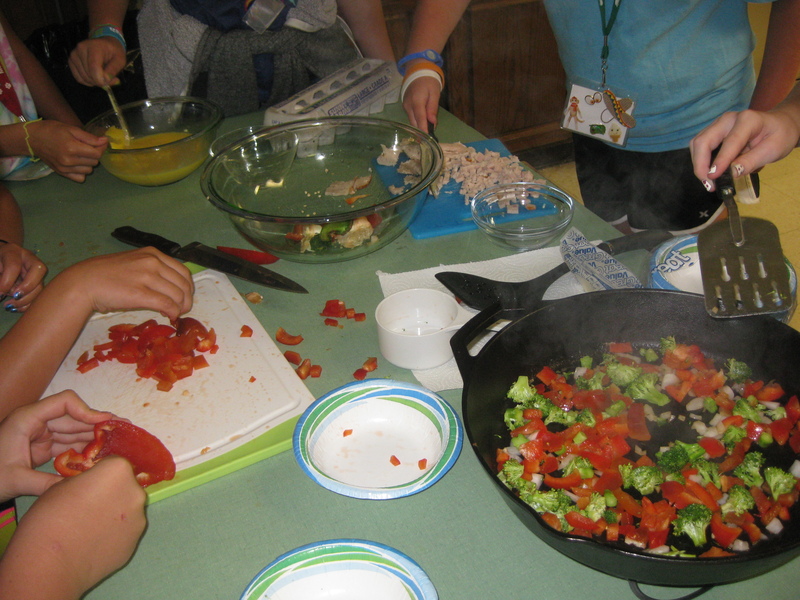 I am a firm believer in getting kids involved in the process of preparing food, and it was so gratifying to see them take ownership of the meal they were preparing. I think my favorite quote of the day went something like this, “I don’t like eggs or chicken or broccoli, but this was really good.” As we sat around the table talking about the textures and flavors of the food they were eating, the kids came up with some great suggestions of other things they could put in with a frittata. We played a revved up version of “Rock Paper Scissors” where everyone starts out as an egg and progresses to a chicken, and then a dinosaur with “claws”. This was a great fit because of the eggs and chicken in our dish, and the “claws” reinforced the lesson on knife safety- how we curve our fingers to avoid cutting them. In a large skillet, heat margarine over medium heat until melted. Add broccoli, red pepper, chicken, onion, thyme, oregano, and black pepper, sauteing until vegetables are tender and chicken is heated through. Sprinkle grated cheddar evenly over surface of vegetable mixture. Pour egg evenly over all ingredients. Cover and cook for 8-10 minutes or until firm. Cut into wedges and serve. 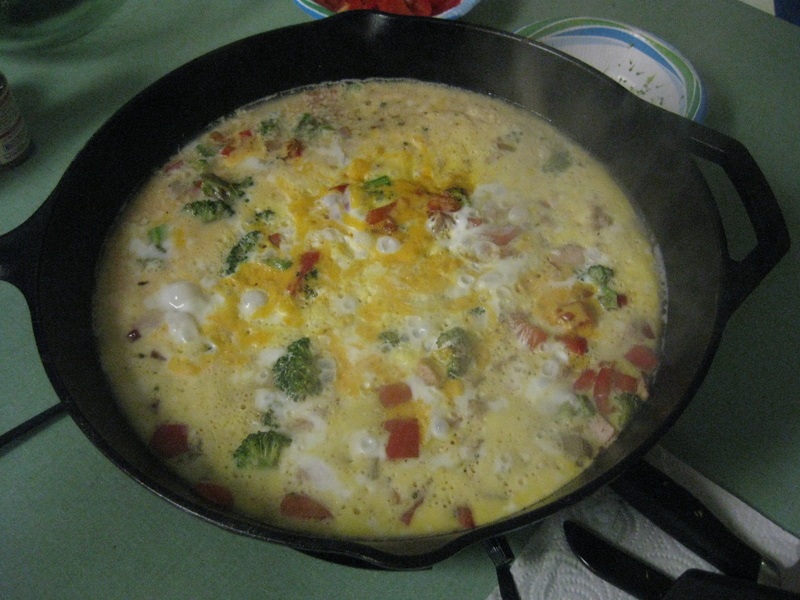 Categories: Community Nutrition | Tags: cast iron, children, eggs | Permalink.